I had a rough nights sleep so today was what I call a fuzzy day. It was chilly and we had our windows open with the Fantastic fan drawing in the breeze. Sammy must have felt a bit chilly so he climbed up on the bed and put his head on my hip. I tried to turn over but he wouldn't budge. Oh well. I waited like a little kid for the rain so I could wear my rain boots but, alas, just a sprinkle. I could have worn them, who would have known or cared? Silly me. On our way to the field we walk up the main road past the office. Ok Lola, pull me along girl! And she does! Near the top she walks beside me so we practice our loose lead walking and her staying close. She does really well. Tonight the light is beautiful up there but again, I didn't bring my phone. The image is in my memory though and I think I could do it justice in paint. Today I did do a small ACEO original and I think I surprised myself. Then ordered a 24 set of Qor watercolors from Amazon and I'm going to paint larger. Very excited and I've found I have more patience being in a peaceful place. 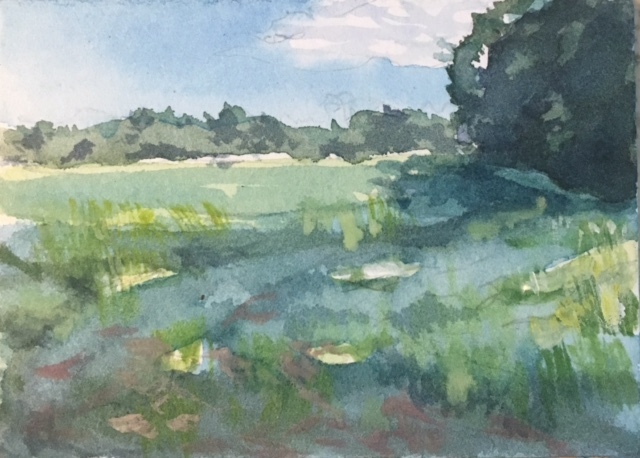 3.5" x 2.5" ACEO watercolor on 300lb paper. I call it "Lola's Path" and is available on my artist page on facebook. It is supposed to be warm and sunny tomorrow! Guess what we plan on doing! No not going to a stable to clean horses...we have our own "horse", (sorry Lola, you are petite) She so needs to be groomed so we will attempt to clean her up. I'll let you know! So have a great night and see you tomorrow.